The Conveyor Equipment Manufacturers’ Association (CEMA) has issued a new standard for the ranking of conveyor belt cleaners, a long-awaited publication that provides performance-based guidelines for specifying belt cleaners by establishing a specific formula for determining the level of difficulty in a given application. The goal of rating the application difficulty is to assist in appropriate cleaner selection, facilitating a suitable choice so both end user and supplier can be satisfied with the result. The new standard is included in the 7th edition of the CEMA book, Belt Conveyors for Bulk Materials, in the section on belt cleaning. According to the organization’s web site, ‘The Classification of Applications for Bulk Material Conveyor Belt Cleaning’ has been established to provide a uniform method for determining the application class of any individual belt conveyor. “For end users, the standard is an objective means of determining a cleaner’s suitability for the plant’s material and operating conditions, allowing them to specify a cleaner most likely to meet their needs,” explained product engineer Daniel Marshall from Martin Engineering. “It also provides a means to check a sales rep’s recommendations against the application requirements, allowing users to compare ‘apples and apples’ in terms of duty rating, performance and pricing.” Manufacturers voluntarily specify into which class their particular designs fall. For belt cleaner manufacturers, CEMA 576 is a way to confirm that a cleaner matches the application requirements, and thereby assure customer satisfaction. “Suppliers can now include a clear ranking on data sheets and other literature, allowing customers to review and compare products,” Marshall observed. The standard uses belt features and material characteristics to develop its ratings, using CEMA Standard 550 to assign values for the material categories. The factors include the conveyor speed, belt width and splices, as well as the material’s abrasiveness and moisture content. Each is scored individually and then totalled to arrive at the class rating for the application. The final score is divided into five application (‘class’) levels and should be specified when cleaners are being selected. Appropriate cleaners should have a rating that meets or exceeds the calculated application class score. Martin Engineering participated in development of the new standard, contributing expertise gained from 75 years solving problems in bulk materials handling. The company has collaborated with CEMA in many capacities, with personnel serving in roles such as president, vice president, secretary and treasurer, as well as officers and chairs of numerous standards-writing committees. Retired CEO and chief technical officer Todd Swinderman (currently a consultant to Martin Engineering) also served as chair and editor of the sixth edition of the CEMA Belt Book” -- Belt Conveyors for Bulk Materials, in addition to editing the seventh edition. CEMA has been the voice of the conveyor industry since 1933, a trade association serving North American designers, manufacturers and users of conveyors and components. The organization is focused on voluntary adherence to design standards, safety, manufacturing and applications to promote the growth of the conveyor industry and the advancement of material handling technology. Membership is comprised of leading manufacturers of conveying systems who design, produce and install all types of conveying machinery, including belt, chain, screw and roller conveyors, as well as bucket elevators. CEMA provides the industry with standards, technical information, safety labels and safety information from meetings where members develop and discuss industry standards, technical publications and new developments in conveyor design, technology, application and safety. 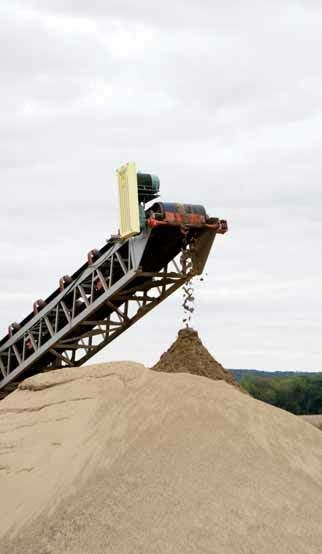 Founded in 1944, Martin Engineering makes bulk materials handling cleaner, safer and more productive. The company supplies conveyor products and flow aids around the world for a wide variety of bulk material applications, including coal, cement/clinker, rock/aggregate, biomass, grain, pharmaceuticals, food and other materials. Headquartered in Neponset, IL, the firm offers manufacturing, sales and service from factory-owned business units in Brazil, China, France, Germany, Indonesia, Mexico, South Africa,Turkey, India and the UK, and under exclusive licence with ESS Australia.